Continental/United 737 all jacked up and nowhere to go, a photo by ladywriter47 on Flickr. 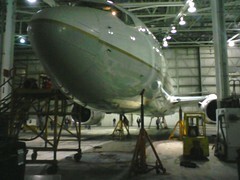 Recently, I had the opportunity to watch routine maintenance be performed on several of Continental/United’s 737 jets. I took a few pictures including the one above, but they don’t really reflect the scope of the actual endeavor. Mechanics take this huge jet, lift it on four jacks, and retract the landing gear. They do this to test the backup system of lowering the gear, which relies on gravity. Seeing this task performed made me realize just how much it costs to keep these jets flying. The supervisor showed us a spare engine that cost $2 million. That’s for a single engine — one half the going power of this particular jet. I must admit I was impressed to see about 60 mechanics working through the night to keep these planes safe and running. They, like many others, work behind the scenes every day without much credit or attention. So, next time you arrive safely at your destination, think not only of the pilots who got you there, but also the mechanics who kept that plane safe to fly. And perhaps spare a moment’s thought for other “backroom workers” — the cooks, the cleaners, the assembly line employees, all those who help make our lives what they are. Of course, seeing the jet jacked up like that also reminded me of that song, “All Jacked Up.” So, for your entertainment, I’ll close with a link to to Gretchen Wilson singing the tune. 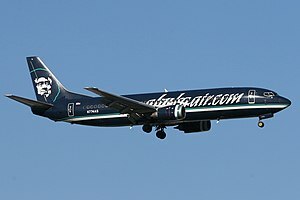 Oh, and here’s a 737 in flight, just for comparison. This entry was posted in Rave, Uncategorized and tagged 737, Boeing 737, Continental Airlines, Gretchen Wilson, Landing gear, Maintenance, Mechanics, United Airlines. Bookmark the permalink.